Overview - America, 1976. The last day of school. Bongs blaze, bell-bottoms ring, and rock and roll rocks. Among the best teen films ever made, Richard Linklater’s Dazed and Confused eavesdrops on a group of seniors-to-be and incoming freshmen. A launching pad for a number of future stars, Linklater’s first studio effort also features endlessly quotable dialogue and a blasting, stadium-ready soundtrack. Sidestepping nostalgia, Dazed and Confused is less about “the best years of our lives” than the boredom, angst, and excitement of teenagers waiting . . . for something to happen. Life is full of many transitional periods. Hell, in many ways life itself is just one big transitional period. An endless ebb and flow of cascading stages and shifting phases, we move from one point to the next, from childhood to adolescence, changing and evolving, questioning and learning, rebelling and fighting, and sometimes, just sitting back to enjoy the ride. Richard Linklater's 'Dazed and Confused' examines one such fluctuating time, following a diverse ensemble of high school students in 1976 as they celebrate the last day of the school year with a crazy night of hazing, fun, and wild partying. As the sun goes down, various cliques and personalities mull over life in semi-coherent musings while they all get high, drunk, and into lots of trouble. Filled with tons of memorable characters, dialogue, and situations, Linklater's stylistically and structurally lax examination of youthful abandon and growing pains, crystallizes a specific era and culture while still maintaining an effortless air of timeless, universal relatability. The loose plot revolves around a class of incoming high school seniors and freshmen as they enjoy or simply try to survive the first night of summer vacation. A sprawling cast of characters guide us through the night as we jump around from one clique and social group to the next, including jocks, nerds, outcasts, stoners, and everything in between. The various archetypes are all juxtaposed against one another as members of each group mix in and out of their various crowds, blurring the lines between them while highlighting the differences and similarities that bind and separate them all. The social hierarchy of high school society itself is examined, and each isolated arc ends up playing a larger role in a free flowing tapestry of amusing conversations, comical hijinks, and just plain fun. Traditional plot really isn't a priority here, and Linklater instead chooses to focus on smaller moments, showcasing the teenagers simply being teenagers, with many scenes capturing nothing more than the kids driving around and hanging out. This approach leads to a very stripped down, sincere, and ultimately heartfelt tone that makes these characters feel like real, fully realized individuals. The actual way the story is told, perfectly mirrors their personalities and the kinds of situations that they find themselves in. While the narrative is mostly episodic and free of conventional structure, there are still several distinct plotlines that connect the various, juggling stories into a slack but still cohesive whole. Throughout the night, seniors chase down helpless freshmen in order to painfully haze them into high school life, and a pot smoking football player (Jason London) struggles with his own conflicting ideas of freedom and responsibility. Going along with these storylines, the real heart of the movie rests in the dual arcs of incoming freshmen Mitch Kramer (Wiley Wiggins) and Sabrina Davis (Christin Hinojosa). At first tormented by their upperclassman, they're eventually invited to ride along with their elder peers, and throughout the wild night they are given their first dramatic peek into high school life, filled with lots of drinking, pot smoking, flirting, occasional danger, and carefree abandon. Watching the world of the film through their fresh eyes gives the proceedings a sweet and honest feel, that helps to ground and seep the movie in a certain kind of realism. The cast itself is mostly fantastic, featuring some very entertaining turns by the likes of Ben Affleck, as a sadistic two-time senior obsessed with torturing as many freshmen as possible, and Rory Cochrane, as a quintessential stoner who delivers a particularly entertaining discussion that ties George Washington, weed, and aliens together in a mishmash of paranoid pothead logic. Even the very minor supporting characters each get their own moments to shine. Special recognition must of course go to Matthew McConaughey for his legendary and iconic portrayal of the aging David Wooderson, a sort of creepy yet still somehow effortlessly cool man who can't seem to let the glory days of high school go. Every word out of his mouth is pure gold, and has been and will continue to be quoted countless times. Unfortunately, not all of the performances are top notch, and some of the actors' line readings can come across as stilted or unnatural. Strangely though, this really doesn't hurt the film, as the occasionally uncomfortable delivery works well with the whole awkward, realistic vibe that Linklater is going for. Stylistically, the director employs a fairly no frills visual approach, usually letting the characters' actions simply speak for themselves. Much of the film has a very fly-on-the-wall, almost documentary feel, that puts us right into the situations and events. Though Linklater usually practices restraint, there are still several instances where a more energetic and overt style is displayed, including some cool POV shots, uses of slow motion, and camera movement. Outside of his visual choices, the music in the film becomes a vital factor in the storytelling. The song selection, comprised of classic 70s rock tunes, becomes a character onto itself, breathing life and authenticity into every frame. The tracks are perfectly married to the images and it's impossible to imagine the film without them. Adolescence can be a crazy time, full of confusion, frustration, and pain. 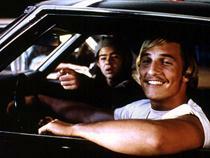 It can also be pretty damn fun, and that's exactly what 'Dazed and Confused' demonstrates. While there are many deep and rich themes at work, there is no real moral, no underlying message, and no actual plot resolution to speak of. We meet our characters in the afternoon, and by sunrise the next morning, they're gone. Linklater has no grand ambitions, he just wants to take a brief look into the lives of a group of youths in 1970s America, to show them doing what the young have, and always will do -- drink, smoke, fight, fall in love, question life, and just keep on livin', man (L-I-V-I-N). This is a pure joy of a movie that captures the intangible essence of youth before it's tainted by the real pressures of adulthood, and it's all done with wit, humor, and plenty of heart. Funny and endearing, this is an irresistible cult classic. 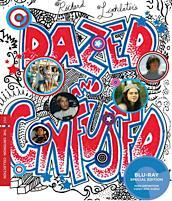 Criterion brings 'Dazed and Confused' to Blu-ray on a single BD-50 disc housed in a foldout case that comes packaged inside a cardboard slipcover with spine number 336. The front of the slipcover has various circular holes that then line up with the art of the inner foldout case, forming a pretty cool multi-layer cover design that's a nice little break from Criterion's standard packaging. Also included is a fantastic seventy two page booklet with essays by Kent Jones, Jim DeRogatis, and Chuck Klosterman, as well as some reprinted recollections by the cast and crew, and some character profile excerpts from the 'Dazed and Confused' companion book. If that wasn't enough, the movie's original poster by Frank Kozik is also included. The movie is provided with a 1080p/AVC MPEG-4 transfer in the 1.85:1 aspect ratio. Supervised by cinematographer Lee Daniel and director Richard Linklater, this transfer is a welcome improvement over Universal's previous effort. The print is in good shape, with no major signs of damage, and a light, natural layer of grain is visible throughout. Detail is often stronger than the Universal transfer, and the film has a bolder, richer quality. Criterion has employed a warmer color palette that makes the previous release look rather dull and blue by comparison. The sometimes flat, faded quality of the Universal disc is now replaced with several instances of depth and strong pop, that show off the creative 70s production design and costumes well. Black levels are consistent (though slightly crushed at times) and contrast is strong. Framing has also been shifted around a bit with less information visible on top and more on bottom. Though this new Criterion transfer is often sharper, deeper, and bolder in appearance, the Universal release is distinctly brighter in several instances (most notably the party at the Moon Tower and conversation on the football field). Similar to the previous disc, faint vertical lines in a few panning shots and some slight edge enhancement are both apparent, but neither detract much from the presentation. Quite different in appearance, this director supervised transfer appears to more accurately represent the film and offers more pleasing colors, pop, and depth. While some might prefer the cooler palette and brighter picture of the Universal release, this disc is the more authentic and impressive of the two options. The movie is presented in an English DTS-HD Master Audio 5.1 track with optional English subtitles. So far as I can tell this mix is very similar if not identical to the audio on the Universal disc. Thankfully, that's a good thing and below I've reprinted my previous comments from that earlier review. Fueled by one of the best rock soundtracks to ever grace the silver screen, the audio sounds very nice. Dialogue is clean and clear. Directionality is solid, with appropriate effects moving around the soundstage. Surround use is fairly active, bolstering the music and adding some ambiance. Imaging can seem a little unnatural, particularly when characters' voices switch between speakers mid sentence, but it's never really distracting. Dynamic range and bass activity are strong, especially in the rock soundtrack, delivering each classic tune with great fidelity and a full gamut of frequencies, including an occasionally booming low end. Balance is mostly good, but the music tends to be mixed a little higher than the rest of the audio elements. This isn't a totally enveloping auditory experience, but the modest yet fun sound design, great music, and technical proficiency, suit the production well. Criterion has put together an exceptional collection of supplements, including a commentary, retrospective documentary, deleted scenes, and hours of interviews and behind-the-scenes footage. The only extras missing from the Universal release are some silly PSAs (that had little to do with the film in the first place), and a pretty useless U-Control feature that listed the songs in the film as they played. All of the special features are presented in 1080i with Dolby Digital 1.0 (or in some cases 2.0) sound with no subtitle options. Audio Commentary with Richard Linklater - The director provides a great track that is both informative and entertaining. Linklater discusses the real life inspirations for the plot, the importance (and expensive price tags) of the music used, the casting process, changes from the script, and the improvisational nature of the shoot. The director also provides some very candid information about the frustrations that came with working on his first studio film and details some of the more heated arguments that arose between him and the producers. He also vents his disappointment about the movie's limited release and takes full responsibility for Wiley Wiggins's constant nose touching. Filled with funny stories and great insights into the good and bad aspects of studio production, this is a very strong track that fans should definitely give a listen. Deleted Scenes (HD, 26 min) - Seventeen deleted scenes are included viewable together or separately. Most of the excised material is pretty disposable but still entertaining, amounting to a few more meandering, philosophical conversations and some minor bits of plot development which would have served to clearly bridge some events (including more about the statue theft and vandalism). The real draw here, though, is of course… more Affleck! While not revelatory, fans will still want to check this out. Making Dazed (HD, 46 min) - This is a retrospective documentary that features behind-the-scenes footage, vintage interviews, and newly conducted interviews recorded in 2003 and 2004 (including material from the tenth anniversary reunion). The entire production is traced and many great stories are shared by the cast and crew about the shoot including more details on director/producer conflicts and fun anecdotes about the casts' wild behavior and lasting friendships. Comprehensive and amusing, this is a great doc. Auditions (HD, 23 min) - Original audition footage for Michelle Burke, Rory Cochrane, Adam Goldberg, Cole Hauser, Christin Hinojosa, Nicky Katt, Jason London, Deena Martin, Matthew McConaughey, Anthony Rapp, Marissa Ribisi, and Wiley Wiggins are included, viewable together or separately. It's fun seeing the actors' initial interpretations of their roles and it's easy to see what Linklater saw in them that led to their casting. Beer Bust at the Moon Tower (HD, 2 hr) - This is a comprehensive collection of rare behind-the-scenes footage and interviews from the shoot. The material is separated into three sections with individual clips in each. Each clip can be watched separately, together with the rest of their category, or together with the material from all the sections to form one long, random chunk of footage. There are thirteen "Character Interviews," which involve various cast members answering questions about their characters. Some performers are more enthusiastic about the creative exercise (especially Parker Posey) and others are more reluctant (Rory Cochrane is especially uninterested). Twelve "Cast and Crew" interviews are featured, providing more vintage on-set conversations with the director and performers. Christin Hinojosa's interview is especially insightful and rather bittersweet. Rounding out the feature are fourteen pieces of "Behind-the-Scenes Footage," which includes more on-set interviews, a look at the film's props, and a particularly amusing clip that involves the movie's costume supervisor modeling several of the characters' wardrobes (the way she channels each actor and character's body language is almost scary). With two hours of material spread over the three sections, this is an absolute treasure trove of behind-the-scenes footage for fans. Trailer (HD, 2 min) - The film's trailer is included. 'Dazed and Confused' is a funny and heartfelt look at adolescent culture through a loose lens of organic storytelling that's free of the rigid constructs of traditional plotting. The director and cinematographer supervised video transfer is a visible improvement over the previous Universal release, and the audio appears to feature the same strong mix. Supplements are exceptional with a wealth of great vintage and retrospective footage. Rounded out by some creative packaging and a really cool booklet of additional material, this is a fantastic release from Criterion that comes highly recommended. It also makes a very worthy double dip for any fans that may have already purchased the previous disc.